Mahindra e2O and CarzOnRent have come up with a unique partnership program - basically to promote the newly launched electric car in India. Now, you can self drive a Mahindra e2O by taking it on rent via CarzOnRent through its three dealerships - Mumbai, Delhi and Bangalore. The India based car maker has as of now deployed 15 cars, 5 in each city which will be given on rent. Subsequently, the number of cars will be increased and more cities to be added in the concept. This is a wonderful concept for a cleaner and a greener drive. - Log on to the website and select the date and time of your preference. - Enter your credit card details - A refundable security of Rs 5,000 is blocked. - Minimum time of picking up a Mahindra e2O is 2 hours - Rs 225. 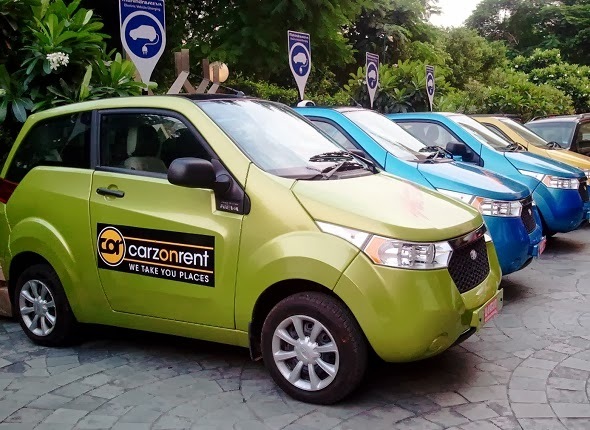 Mahindra Reva and CarzonRent claim that over 100 recharge points are being set up around the three cities – Mumbai, Delhi and Bangalore. With the Mahindra e20’s incredibly low running costs, this works out to one of the cheapest modes of transport. A full charge will cost you about Rs. 50 depending on your electricity unit rate. It takes about 8 units of electricity for a full charge, which can be achieved in about 5 hours on a fully depleted battery or about 3 hours when you have 30% charge remaining. It can also recharge up to 80% capacity in 1 hour.